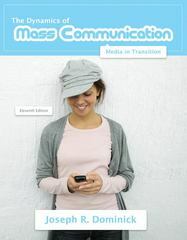 Dynamics of Mass Communication: Media in Transition 11 Edition Well-known for its balanced approach to media industries and professions, Dynamics of Mass Communication offers a lively, thorough, and objective introduction for mass communication majors and non-majors alike. Dynamics of Mass Communication takes a comprehensive and balanced look at the changing world of mass media. The new edition explores how the traditional mass media are dealing with shrinking audiences, evaporating advertising revenue and increased competition from the Internet. The 11th edition brings students up-to-date on the latest developments in the media world including Facebook, Twitter and other social media; new media business models; e-book readers; online video sites such as YouTube and hulu.com. ; the decoupling of advertising from media content, and many more.